We all know that drinking water is essential to a healthy life, keeping fit and maintaining a healthy body, but sometimes remembering to drink enough water is just hard. We’re busy, we are bombarded with other tastier beverage options, and we sometimes just don’t realize until the end of the day that we definitely didn’t drink enough water. So to help with this, I’ve compiled a list of life ‘hacks’ that will help you drink more water daily. 1. At night before bed, set a glass or bottle on your kitchen counter to remind you to drink first thing in the morning. This works if you put it in the way of your coffee maker or cereal box so you have to see it first. 2. Stock your car with bottles. You know all those cup holders for every seat of your car? Try to keep full water bottles in them, especially if you drive a lot. Obviously be careful of freezing, but when possible, just load up the holders and you’ll never be without water while driving, even if you forgot to bring some for that specific trip. 3. Stock your fridge. Get 12 water bottles and put them on the top shelf of your fridge, or get a large pitcher full of water and have it ready as soon as you open your fridge. If its the first thing you see when you’re going for a drink, you’re more likely to grab it! I really suggest using something like a Brita Water Pitcher. It does help filter out some of the extra chemicals in tap water, and helps the environment by using less plastic bottles. 4. Find a water bottle that fits your lifestyle and use it. Some people like bottles with straws, others just want something stylish. Whatever the reason, if you find a refillable bottle you like, you’re more likely to use it daily. 5. If you’re not a fan of plain water, add fresh squeezed lemon juice, sliced cucumbers or even strawberries to your water to give it a fresh taste. 6. Find the right water temperature for you. Some people like cold, just out of the fridge water, while others prefer room temperature. 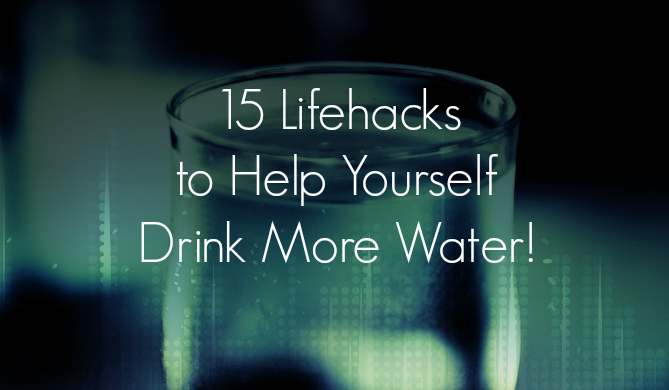 Find out what you prefer and stock up the water at that temperature! 7. Drink a glass water as soon as you wake up every morning. Once you do this for a week or two (you may have to force yourself to remember), it’ll become a routine and you’ll start doing it without thinking. 8. Have a full glass of water before every meal. As soon as you’re thinking about sitting down for a meal, drink a full glass of water. This not only hydrates you, it helps with digestion and can help suppress hunger making you eat less (normally a good thing for most people!). I’ve found it also works if you’re cooking the meal to just have a glass of water that you drink by the time the meal is ready to eat. 9. Drink a glass before going to bed. 8 hours of sleep without drinking can dehydrate you, so prep your body an drink a glass before bed. If you make this part of your nightly routine, it’ll come easier over time. 10. Use an app. There are a number of apps for every smartphone that help you track your water intake to see how you do on a weekly basis and will also buzz you with reminders to drink. For Android I recommend Hydro Coach, but there are a number of apps for every phone platform. I found this really helpful to get into drinking enough water. Once you see how much/little you drink each day, you realize that you have to make changes. 11. Get a Drinking Buddy. Not the ‘hit up the pub’ kind of drinking, but a water drinking friend who will always remind you and keep you in line. Getting a work friend to help during the day and having a roommate, spouse or someone else at home remind you at night is the best way. 12. Use washroom breaks as a reminder to drink more water. Think of it as replenishing your system. Every time you use the washroom, grab a glass of water! 13. Buy a water filtering system. Could be as simple as a Brita pitcher that you put in the fridge or a full out pre-faucet system. Either way, by making that purchase you’re not only drinking better water, you’re also reminded more often to drink the water you’ve spent money on! 14. Remove the bad options from your life. Sometimes its hard to choose between a glass of water and a soda. So why put yourself through that choice? Just remove all bad drinks from your fridge and only stock the good: real juices, milk and water. Then when you go to the fridge, you’re more likely to choose the water. 15. Think in terms of saved money. When you’re out at a restaurant, choose a glass of water over the pop and you’ll be saving money every time (at least in most restaurants). This can add up, especially if you eat out often. Every time you order water, just keep track of the money saved and after a month, you’ll be very impressed.